We all do enormous amount of activities with our minds: we think, we solve problems, we take decisions, we come up with new ideas. But for ,most of us the mind is like a blackbox. We just know that something has happened inside but do not know what and how and how long did it take. Last week I happened to come across a problem (reproduced below). As I looked at the problem, a solution came in to my mind. May be not the best solution, but I did something interesting. I tried to retrace what happened in my mind during the problem solving. Problem statement: (I think this is originally from www.systematic-innovation.com) TRIZ is always encouraging us to think about designs with self-x capabilities. 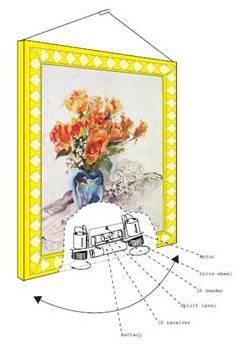 Below is a self-levelling picture frame. Nice concept, but terrible solution – who wants a system where they have to replace a battery! As I finished reading the problem statement, the thing that caught my attention was the word “levelling”. The word “levelling” reminded me of “balance” and there was suddenly a ‘sense of movement’ and ‘a pulley’ came to my mind. But now I could see the wall too, it was a rough wall (it was not really visual, I could sort of feel the roughness) and I realised that the solution will not work on a rough wall. The frame should also be able to move on the surface. Now I see a frame with four smoothe wheers on the back suspended on a pulley that is attached to the nail and this is my solution. I do not know how long this whole sequence took to process in the mind. Perhaps few milli seconds, not sure. What is interesting to me is that the starting point (here the word ‘levelling’) often determines the nature and quality of the solution and perhaps this is what differs across people. A careful observation will tell you that at each state, there is actually a connection made, which is like a choice from thousands of available options and these connections determine the quality of the solution. This is perhaps the reason why most of the systematic innovation techniques do not produce great outputs (some of you might disagree, fine), because they work at a concious level and muh of this happens much before the concious mind kicks in. Is there anayway we can influence this subtle working of the mind? I think we will continue this in the next posts.. This entry was posted in Brain, Creativity, Mind, Thinking, Uncategorized and tagged Associations, Awareness, Brain, Creativity, Innovation, Mind, Nature of Mind, Problem solving, Thinking, thoughts, TRIZ on January 8, 2010 by Sajeev.